Details:	The 135 year old bridge has a superstructure and sub-structure built in masonry, resting on open footings. 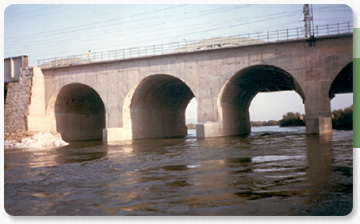 In all there are 23 arches of 9.14 meter span and barrel length of 21 meter. Challenge: Due to ageing, two arch sections had suffered distress and the mortar had leached loosening the stones. Solution:	In order to restore the integrity of the structure holes were drilled along the entire surface of the arch and the pier. Neat cement grouts were injected, dowels were fixed over the entire surface, the area around the foundation was excavated and RCC jacketing was done. Internment of the arch by RCC was also done. Tidal problems and long length of the barrel added to the challenge during this project. 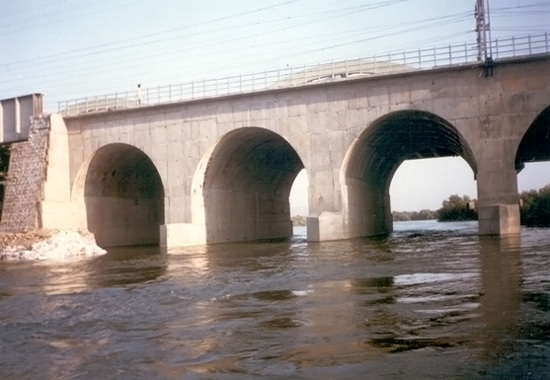 Coffer dams were constructed to isolate the foundation so that the required repair work could be accomplished.